I fell in love with Vance's Mamaw from the first time she was introduced. She was the backbone of the family, foul mouthed, no nonsense with a heart of gold and a 45 tucked in her waistband. This book is truly a testament to her love of family and her hope that she could help change her family's fortune. She may not have known what she was doing some of the time but the wisdom she shared with her grandson and granddaughter really changed their lives. 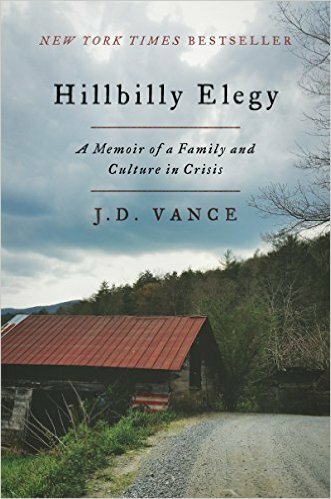 Vance's inside view of the poor white working class is invaluable. He is able to share with us an unflinching look at this subsection of America, and how they are slowing failing without glossing over facts or making it too judgmental. These are his people, his family and most of them he cares a great deal about which can be seen through the way he talks about them. I think it hurts him to see what laziness, fear of outsiders, rampant alcoholism, and lack of responsibility is doing to people. You can see how these things effected him as he grew up and how he still carries the lasting effects of much of it around his neck. If his Mamaw hadn't been the woman she was he may very well have fallen into the same trap as so many of the people he grew up with. Her strength and encouragement carried him through. This book is incredibly timely given the results of our most recent presidential election. I believe Trump really spoke to this failing culture, he is not a politician and while elite he does not appear polished and well spoken like many other political figures. He speaks their language of fear and conspiracy, after all Trump lead the fight in the Birther movement (those who believe Obama wasn't born in the US). I think this is a brilliantly written book not only for its examination of a struggling culture so often forgotten but also for its message of hope for those that can find the strength to not only survive but thrive.